Q: Was M-O a rogue robot? Q: Is 'WALL-E' based on a book? When it comes to animated films, Pixar are masters of the craft. Ever since their feature film debut, the magnificent 'Toy Story', the animation studio have brought us such instant classics as 'Monsters Inc.', 'The Incredibles' and 'Finding Nemo', a film which remains as one of the biggest selling DVDs of all time. Surely it's about time that they delivered us a bad film? Well, sorry to disappoint, but Pixar's 'WALL-E' is among not only their greatest work, but among the greatest animations ever produced. The film opens with some astonishing shots of a desolate, rubbish-laden, polluted Earth; a boldly dark opening for a family oriented feature. It is amidst these dystopian surroundings, however, that our hero - arguably more adorable than a basket full of puppies and kittens - is first introduced to us. WALL-E is a character of genius; combining elements of Johnny 5, Charlie Chaplin and Mr. Bean, Andrew Stanton (Director) and crew have created something that will no doubt go down in history with R2-D2 as one as the screen's most memorable machines. It is the 22nd Century, and mankind have left Earth in giant Space Cruisers waiting for the surface of their planet to finally become habitable again. 700 years have past, and WALL-E (Waste Allocation Load Lifter Earth-Class), is the last of a group of robots left to clean up the planet. 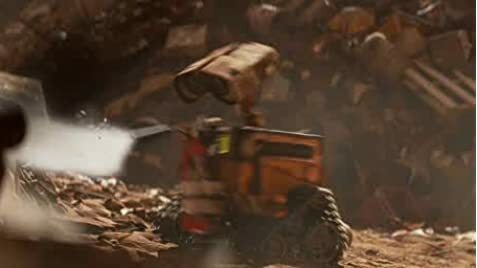 In a disturbing sequence, our hero ventures home through trash heaps laden with 'dead' WALL-E's... another sign that this is not the usually Pixar fare, but something more meaningful, more bold, more... adult in theme. And this is what the first act of the film is. WALL-E, accompanied by his pet cockroach (who, as a testament to Pixar's genius, we grow to care for just as much as the metal man himself), goes about his daily routine. It is in this mostly silent section of the film that we grow to love WALL-E. As he rumages through human garbage, finding interest in things that seem mundane to us, we discover that after all these years, this little robot has developed something that makes him seem more to us than an animated clunk of cogs and rust... a personality. His incredibly curious nature make for some of the most adorable moments depicted in film (including moments such as WALL-E meets car keys and WALL-E meets... bra). We delve further into this intriguing personality when we invited into the little guy's 'house', a storage space for all his collected junk. Whilst WALL-E watches a VCR of the musical 'Hello, Dolly! ", we see from his large, emotional eyes and clasping hands that he is, heartbreakingly, all alone on this immense world. Then, the following day, as WALL-E goes about his trash-cube-making business, something extraordinary, both to us and WALL-E, occurs. A space ship touches down on the surface, holding within it EVE, a futuristic, Ipod-resembling droid here to scout the earth for plant-life... and WALL-E's one true love (aww). This love story eventually leaps from Earth into space and onto The Axiom, an immense Space Ship on which a large number of the American population - depicted as lazy, obese, consumerist slobs - go about the same mundane routine day in, day out. Message heavy, but never preachy. In the end, through WALL-E, everyone learns the true meanings of life: Love and the relationships with those around us. Oh, and to take care of the planet, of course. 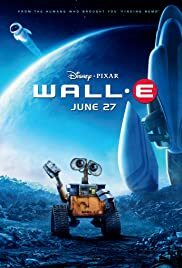 Beautiful visuals, astonishing characterisation and a sequence with WALL-E and EVE floating through space that is more romantic than anything your likely to see this year, make 'WALL-E' an outstanding achievement that proudly stands among Pixar's finest work. WALL-E is a completely realised character, and one which I am sure we have not seen the last of. Although, some would argue, not as accessible as other films in the genre (some children may grow resteless during the film's earlier, dialogue-free sequences), 'WALL-E' will leave a lasting impression on cinema goers of all ages. And that is the genius of Pixar. The only studio ever to create films that are, truly, 'for all the family'.